The former Brunswick Wesleyan Church was built to a design of Percy Oakden in 1872. The building exterior is a towered Gothic Revival design in the French manner, however the polychrome brickwork demonstrates an Italian influence. The church houses a notable organ and wall-painted banners typical of Italian Gothic (or Romanesque) Revival manner often used in secular schools of the period. The interior of the former Sunday School is a grand two-level space, surrounded on three sides by a cast-iron balustraded gallery from which the classrooms radiate with stepped gallery floors. The former Brunswick Wesleyan Church and Model Sunday School are significant for architectural and historical reasons. The former Brunswick Wesleyan Church is architecturally significant as an excellent and largely intact example of the work of the distinguished architect Percy Oakden. 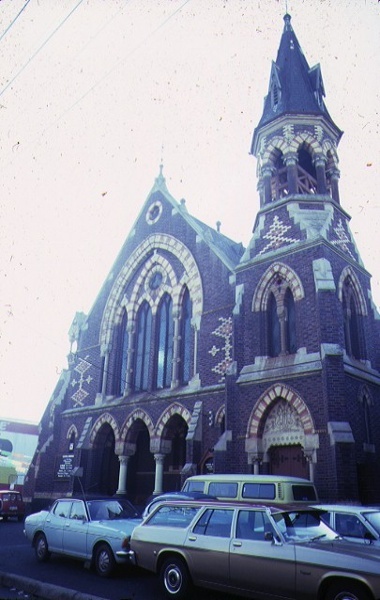 The building was the first of a series of polychrome churches designed by Oakden, later Terry and Oakden, and it serves as an outstanding representation of polychromatic architecture in Victoria. In 1886 the church trustees engaged Percy Oakden and Leonard Terry to design the Model Sunday School, however the trustees could not afford the tendered price and a young architect, Alfred Dunn, was engaged in their place. The Model Sunday School is architecturally significant for its consciously innovative design which brought together contemporary architectural philosophies and the teaching doctrines of the Wesleyans. The distinctive gallery was designed to bring about the best possible combination of acoustics and vision and the radiating classrooms have their foundations in the panopticon principle which promoted supervision under separation. The former Brunswick Wesleyan Church and Model Sunday School are historically significant for their integral associations with the Wesleyans and as monuments symbolising the Wesleyans’ devotion to their church. The Model Sunday School is of historical significance for its ability to express the innovation that the Wesleyans brought to Christian teaching methods. Former Wesleyan Church and Model Sunday School, 340-350 Sydney Road, Brunswick, City of Moreland. 1. All of the buildings known as the former Wesleyan Church and Model Sunday School marked B-1 and B-2 respectively on plan 604407 endorsed by the Chair, Historic Buildings Council and held by the Director, Historic Buildings Council. 2. 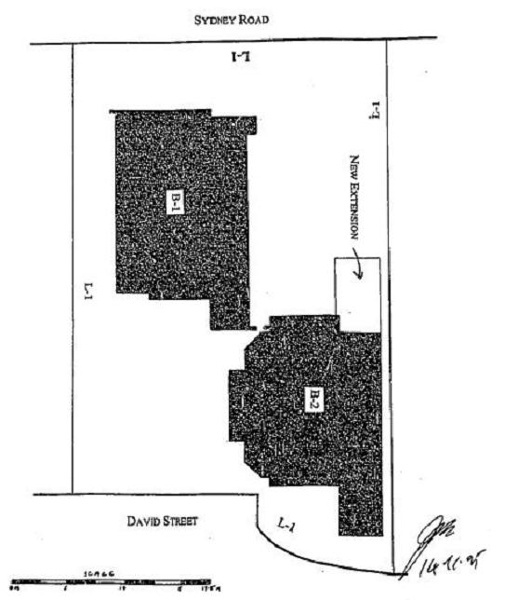 The land marked L-1 on Plan 604407, being the land described in Certificates of Title Volume 5712 Folio 324 and Volume 982 Folio 391 endorsed by Chair, Historic Buildings Council and held by the Director, Historic Buildings Council. The present church building, the fourth on the site, was erected in 1872 to the design of architects Fox and Oakden of Ballarat. 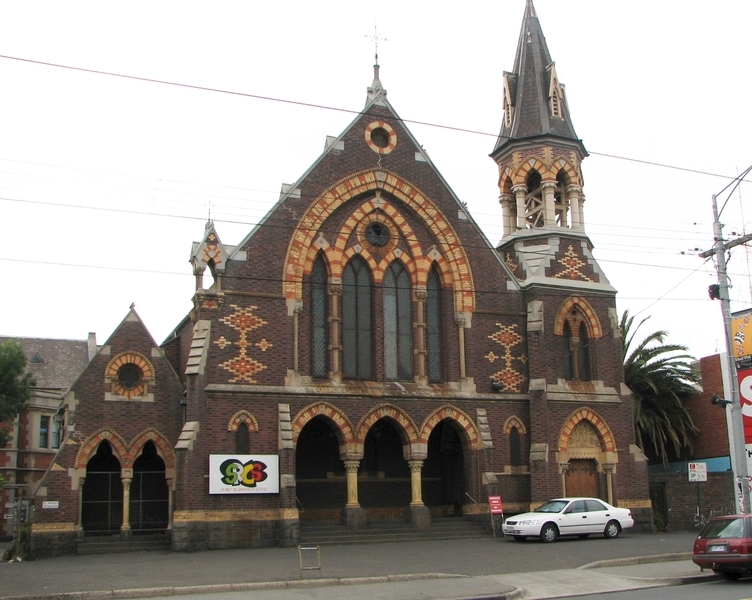 The building displays polychromatic brickwork used in a decorative Gothic manner; similar to that designed by Joseph Reed for St Jude’s Church of England, Lygon Street, Carlton six years earlier. The bricks for this church and Reed's Independent Church, Collins Street, Melbourne (1867) were produced by John Glew, an involved member of the Brunswick Wesleyan Church. 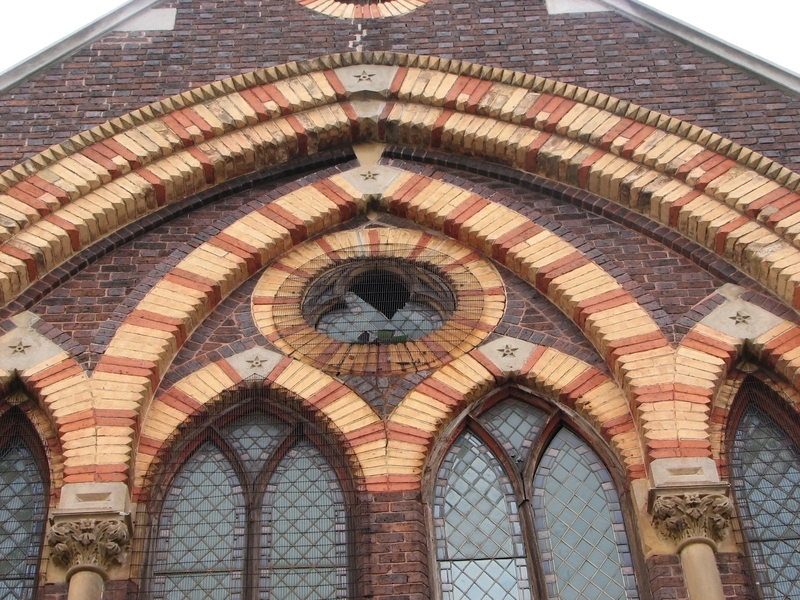 Polychromatic brickwork had been revived in England in the 1840's by architects such as William Butterfield, but the revival did not gain popularity in Melbourne until the late 1880's. 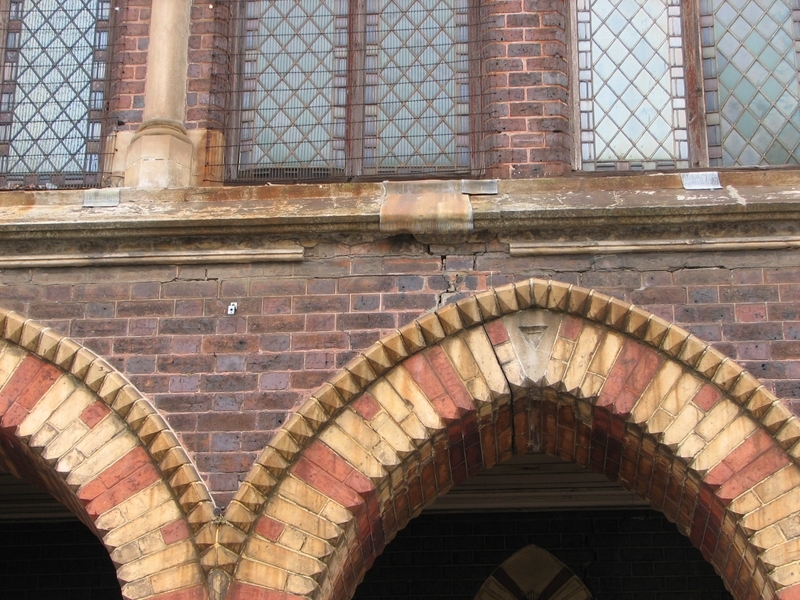 At Brunswick, cream and red brickwork contrasts with brown brick in diaper work and around openings. A squat belltower adds massiveness to the composition while the steep slate roof, side buttresses, lancet windows and the brick tracery of the front window have a Gothic character. Internally, arcading and clerestory windows with quatrefoils continue this character. This church is an outstanding and early example of decorative polychromatic architecture in Melbourne.